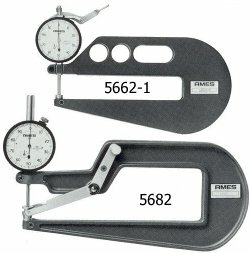 Indicator Bezel Diameter 2 5/16"
This unusual gage, Model 63-281, is widely known for its exceptionally light evenly distributed gaging pressure, permitting it to check thickness of foam rubber and other materials of similar compressibility without compressing the material. No spring pressure is applied to the 1 1/4" diameter aluminum upper contact. 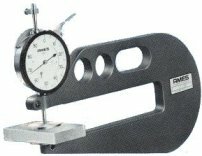 Only the very light weight of the contact itself determines the measuring pressure which is distributed over more than a square inch of contact area. Gage capacity is one inch. Throat depth - 6 inches. Indicator has .001" grads. Force approximately 33 grams. Available in other throat depths, ranges and with digital readout. . . . . . . . . .0 . .
5664 6" 0-50 Lever .500 . . . . . .
5664-1 6" 0-50 Lever 1.000 . . . . . .